Moments ago, Google lowered the price of the Nexus 6P (all models) on the Google Store by $50, bringing the starting price to $449 for the 32GB model. For those who need more storage, you will be happy to know that the 128GB model also saw the price cut, with the device now priced at $599. On December 9, Google lowered the price of the Nexus 5X by $50 as well. Whether these changes are permanent or just fore the holidays remains to be seen. What we know is, the Nexus 6P just became a whole lot sweeter of a buy. To sum it up, the 32GB model in all colors except Frost White (not available in 32GB) is $449. The 64GB in all colors is $499, and the 128GB (currently unavailable in Graphite) in all colors is $599. Follow the link below to purchase the Nexus 6P at the discounted price. 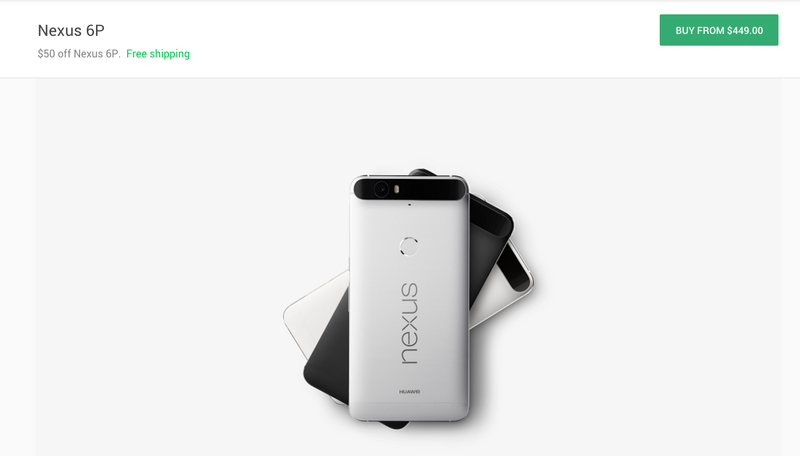 Update: Also, the Google Nexus Twitter account announced that all US orders will receive free overnight shipping, too. Hooray.